Tirecare MTB Half Century Ride Putrajaya 2016 | JustRunLah! Tirecare MTB Half Century* Ride Putrajaya 2016 is the first ever event of its kind in Malaysia with an anticipated number of riders of 1000 and more than 4000 total visitors. This half century ride will pose a unique and challenging experience to all mountain bikers. Putrajaya, the location for this event further adds to its uniqueness. Due to restrictions imposed by local authorities, few events like this are allowed in Putrajaya. Its beautiful, long stretches of roads and scenic views make Putrajaya an excellent location for this riding experience. 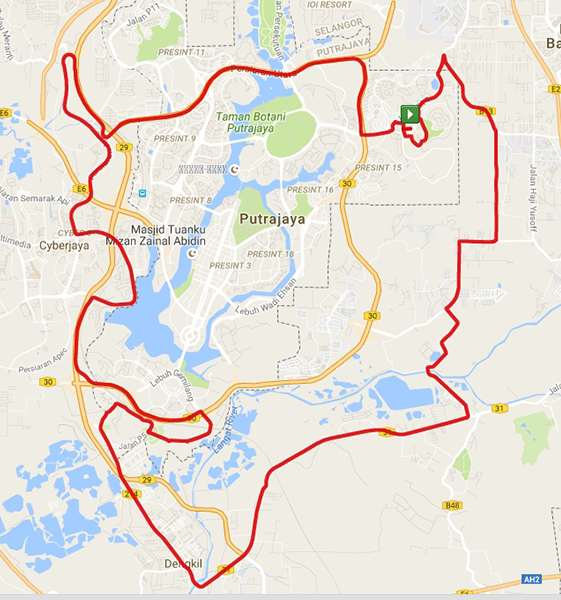 The ride will cover various parts of the Putrajaya/Cyberjaya township. Approximately 15 hills, including the famous 6-brother hills, will be covered, as well as stretches of roads in the Putrajaya and Cyberjaya residential areas and town centers. Double century, 200 miles (320 km) in 24 hours. The term Imperial century is sometimes used outside the United States and United Kingdom to indicate that 100 miles in imperial system is used instead of the implied 100 kilometers in metric system. Tirecare MTB Half Century Ride uses the metric measurement.